Hand-crafted with precision, one at a time. Machined from solid tungsten carbide. Finished and polished by hand with diamond paste. Rich smooth tone. Killer attack. Nearly two years in the making, Precision : Strike is utterly unique. Hand crafted from a solid nickel tungsten carbide metal matrix composite - twice as dense as steel and nearly as hard as diamond - it sounds and feels like nothing else on the planet and will last practically forever. Precision-radiused edges and a picking point hand polished to perfection with diamond paste give Precision : Strike a beautiful smooth, rich tone. This can be progressively sharpened or mellowed with picking technique to access a broad pallette of sound and dynamics. Precision-radiused edges and a picking surface hand polished to perfection with diamond paste give Precision : Strike a beautiful smooth, rich tone. This can be progressively sharpened or mellowed to access a broad pallette of sound in response to different pick attack angles and styles. The weight and perfect polished surface give you unprecedented control over dynamics: you can control electric guitar tone from clean to searing overdrive with touch response alone, or extract every nuance from an acoustic guitar. Precision : Strike is engineered with a slight lip around the edge, to kick off every note with a powerful, authoritative attack without sounding brittle or metallic. At 1mm thick and nearly eight grams, Precision : Strike feels solid and luxurious, and enables the finest control over pick attack style. 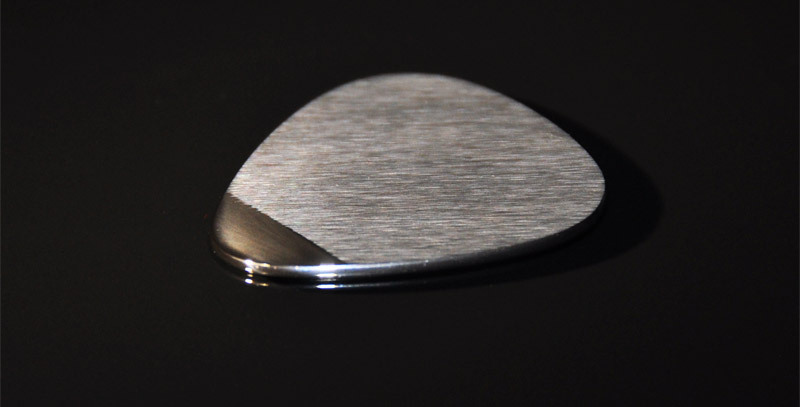 The microscopically smooth edges and picking point enable the pick to glide across the strings with virtually no friction. The sides have a brushed finish, giving just the right level of friction to ensure a secure grip. "This thing is absolutely charged with energy ... the dynamic and tonal range available is exceptional. The attention to detail and finish is flawless." Precision : Strike is available in our flagship solid tungsten carbide. More stunning material choices will be available soon. "It feels really fine... it is very direct and very fast, even compared with a Blue Chip pick."